As if life couldn’t get any busier, it’s now the holiday season! Anyone else in a bit of a panic to get an extremely long To-Do list done, yet still manage the daily stuff – you know, like eating? Plus planning a big Thanksgiving feast is a whole list of tasks in and of itself! Phew! Luckily we can make our lives a little bit less stressful with delish, easy recipes like The Best Breadsticks & Alfredo Sauce for Your Holiday! You know how my family loves pizza? I guess most probably do! For those days, or seasons, as the current case would be, that we don’t have much time to spend cooking we LOVE the variety offered by CALIFORNIA PIZZA KITCHEN® Crispy Thin Crust Oven Ready Pizza – especially their Sicilian! I like to stock up on several varieties when I’m at Walmart and keep them readily available in my freezer. Seriously, NESTLÉ® products like this are what save my sanity this time of year! Then I just whip up amazing and SIMPLE recipes that go great with them – like this creamy alfredo sauce and soft, flavorful breadsticks! Mix the yeast and warm water in a small bowl, set aside. In a large bowl, combine the flour, sugar and salt. Add the yeast mixture until it forms a nice dough. Knead for about 2 minutes, then cover with a moist towel and let rest for 10 minutes. Melt the 1/2 cup Butter and pour it on a rimmed baking sheet. Lightly flour a work surface and roll out your dough into a rectangle the same size as your baking sheet. Cut 1″ wide strips. Take each strip, bring the two ends together and twist, pinching the ends together to stay. Roll the stick in the butter you spread over your pan and then place on the pan. 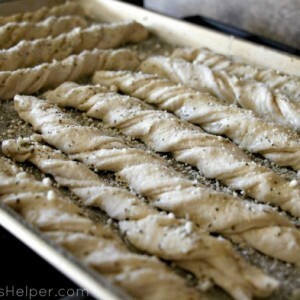 Top your breadsticks with the 1/2 cup Parmesan Cheese, then garlic salt and Italian seasoning to taste. Let your breadsticks rise for 10-15 minutes; meanwhile preheat the oven to 375 Degrees F.
Bake for about 18-20 minutes, or until lightly brown on the edges. Melt the butter in a medium saucepan over medium heat. Add the garlic, heavy cream, pepper and salt and bring to a low boil. Reduce heat and simmer about 7 minutes. Turn the heat to low and slowly add the Parmesan cheese. Cook another 1-2 minutes or until creamy – stirring constantly. Serve it hot so it’s creamy! See, totally simple – and it goes perfectly with the CALIFORNIA PIZZA KITCHEN® Crispy Thin Crust Oven Ready Pizza, Sicilian, as well as their other varieties! Check out more delicious recipes on the Flavorful Moments Pinterest board. Let me know what your favorites are!